Today I found out how a Jake Brake works (also known as “Jacobs Engine Brake” or “compression release brake”). For those who don’t know, a “Jake Brake” is what makes that machine-gun like noise that you might hear from semi-trucks when they head down long steep hills. A normal gas motor uses the air flow from the intake manifold to control air/fuel mixture. This air is provided to the motor’s cylinders and the air/fuel mixture greatly affects how much power you get out of them. When the throttle is closed (you take your foot off the gas), the airflow is significantly restricted. It is the work that your engine has to do against this restricted air flow that provides the braking, sort of like a vacuum pump. This braking effect remains as long as your car wheels remain connected to your motor. Should you engage the clutch, the braking effect of the engine will no longer help you and your car will be coasting down the hill at the force we are currently calling gravity’s whim! The braking force provided by the restricted airflow in this case will vary depending on the engine and what gear your car is in. A diesel motor, on the other hand, has no such similar air restriction device. The diesel motor also does not have a spark plug to ignite the fuel contents. Instead, they use air compression and the heat created by it, to ignite the fuel. When the fuel is shut off to control power (taking your foot off the gas) and you haven’t engaged the clutch, the crankshaft still turns due to the wheels still spinning from the vehicles forward momentum. This continues the process of drawing air into the cylinders, which is then compressed by the pistons as they move back up. Even though there is little or no fuel to ignite in the cylinder, the compressed air still provides something of a spring-back effect on the piston, pushing it back down. This provides a boost in efficiency, in that this process utilizes some of the energy used to compress the air, even without ignition in the cylinder. While this is more efficient, it turns out to not be helpful when you want to try to use the engine to help slow the vehicle down. The Jake Brake works by releasing the stored compressed air before it can have a chance to spring back the piston. Basically, an extra nob, or lobe, is added to the camshaft that opens an added exhaust valve, which then releases all of the stored compressed energy out into the atmosphere, assuming the compression brake was engaged. When the compression brake is not engaged, the mechanism controlling the valve allows it to stay closed, even though the camshaft is still turning (using a telescoping stem that can be locked or unlocked). The energy required to compress the air, which is then released before it can be used to help slightly power the down-stroke, then has the effect of slowing the vehicle down as the air is compressed. Mr. Cummins had prior contractual arrangements with the Cummins Engine Company, so he first attempted to market his idea to them. They unwisely turned him down. The novelty of the idea and the combined factors of an untried mechanical system and the uncertainty of its commercial merit, prompted all of the other manufacturers who used three cam diesel engines to also turned him down. It wasn’t until the opportune marriage between Mr. Cummins’ nephew to the daughter of the Vice President of Jacobs Manufacturing, that led to the Jacobs company’s knowledge of, and interest in, Cummins’ invention. After successful engine tests, an option agreement between Cummins and the Jacobs Manufacturing company was entered into in 1959 and the Jacobs Company established its new Clessie L Cummins Division. The Jake Brake was born! The inspiration for the Jake Brake originally came to Cummins when he and some friends, in 1931, were trying to set a new truck speed record traveling across the country from New York to Los Angeles. While descending Cajon Pass, on old US 66, just outside San Bernadino California, their overused brakes gave out and they found themselves racing out of control toward a train that was traveling across the road. Luckily, nearly the same time they got to the train, the train’s caboose passed, and in the words of Mr. Cummins “we had escaped certain death by inches”. Cummins then began looking into how to make a compression brake for diesel engines. Twenty six years later, in 1957, while in retirement, he succeeded and filed for a patent on his newly invented compression release engine brake. Mr. Cummins and his fellow passengers did indeed set the truck speed record in Aug. of 1931. A running time of 97 hours, 20 minutes was achieved for the 3,214 miles traveled. No doubt that an extremely fast downhill run just outside San Bernadino helped that time just a bit! The first production units for the Cummins NH series engines with their fancy new Jake Brakes left the factory in 1961. Today, Jake Brake retarders are available on almost all major U.S. Heavy duty diesel truck engines. 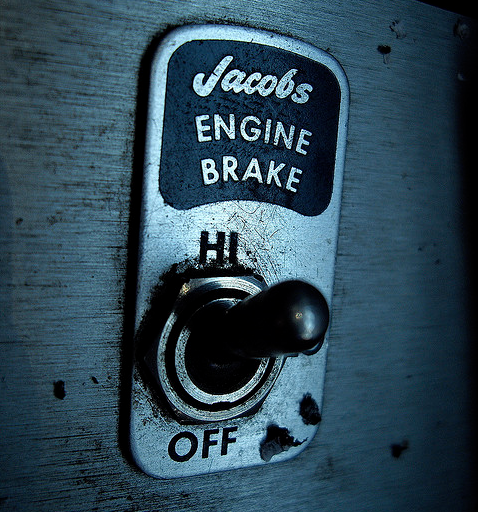 The Jacobs company considers it illegal to use their trademarked name in signs that say “NO JAKE BRAKES”. They also frequently point out that much of the noise from their compression brakes is due to lack of good muffler systems on some of the trucks that use their compression brakes. It is also technically inaccurate from their point of view to say all Jake Brakes are noisy, due to the fact that they make several other types of extra braking systems that are virtually silent. For example, they also produce the Jacobs Exhaust Brakes and Jacobs Driveline Brakes, both of which are nearly silent. Sorry bud but I lost interest when I got to the 4th word of the 2nd paragraph where you used the word motor. It’s not a motor, it’s an engine. The entire article is painful to read — break instead of brake, motor instead of engine, diesel instead of Diesel, plus numerous punctuation errors. Good article on jake brakes. I am searching for information on fighting residents who complain about jakes, since I drive a truck through the mountains, loaded, and coming downhill I have to brake a lot. I do not think any resident should have the right to tell a driver what to do. Sometimes I will let my brakes squeal many times in front of homes, hoping they are the ones who complained. I would rather hear a jake any day than hot squealing brakes. It is not up to a resident to tell a trucker how to drive, and safety on the road is more important than a resident’s baby waking up, or some other stupid crybaby issue. Most people don’t care if you Jake. Most people complain because you probably have a modified muffler and are violating the conditions set forth in the 1972 Noise Control Act.